When you go to the cinema, timing is crucial. You want to get there early enough that you can watch the trailers (I have a love/hate relationship with trailers), but late enough that you miss the dreaded adverts. I inevitably fail and normally miss the start of the film because I'm late, or end up watching every advert before the trailer. I HATE ADVERTS. At least when you are at home and accidentally end up watching a programme on ITV/E4/Channel 4 you can either switch channels or if you are lucky enough you can fast-forward because it is an old recorded episode of Lewis. At the cinema though, you have no escape. At the end of most adverts I am speechless with confusion. I just don't understand them. 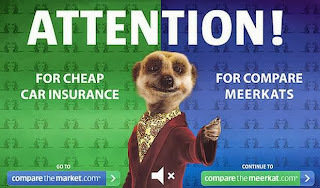 Like the Meercat one pictured above. It's just weird. All I want from an advert is someone to tell me the pros and cons of the product. The end. Am I being unreasonable, or do adverts annoy you too? Do you think they are actually quite clever? *I have since remembered what an HTC is. It's a phone in case you don't know/remember.